To get chiquitas and hombres in the party mood visitors are invited to come and shake their maracas with non-stop DJs and the Squirm Dance Company (26th & 27th all day) or take in the sounds of the infectious, maverick and irresistibly swinging street music of the Voodoo Love Orchestra (27th at 2pm and 5pm). 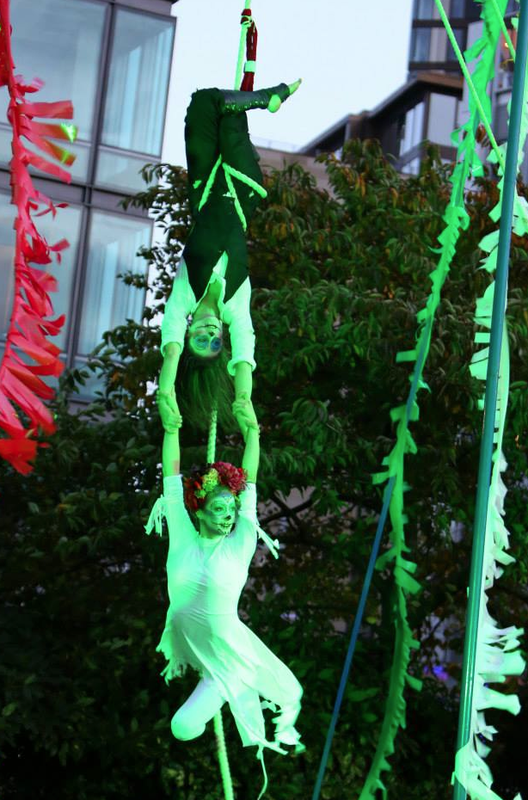 On Saturday Madam Mango’s Circus (pictured top) will perform La Rebelion de los Muertos an aerial acrobat performance (26th September at 11.30am, 1.30pm, 3.45pm) that includes the Ghostly aerial hoop, Dead cabaret trapeze, Buried Alive rope act and the Skeleton duo silks. Dress up all weekend with the help of our all-ages workshops. Make your own Lucha wrestling mask or get painted sugar skull style. 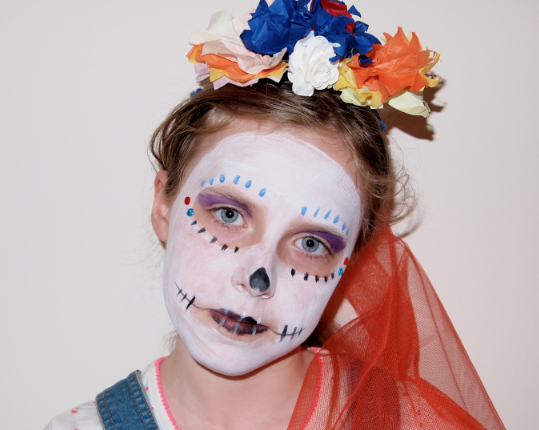 Make a flower garland head dress and march through the streets for a fun-time fiesta. Wear your newly made costumes and join in as the event comes to a close with a ‘Día de Muertos’ Parade on Sunday at 5pm. A giant sugar skeleton, the lonesome Mariachi Man and Lucha Libre wrestler La Tigressa will be on hand to lead you through the streets with the sounds of the Voodoo Love Orchestra announcing the parade’s arrival. 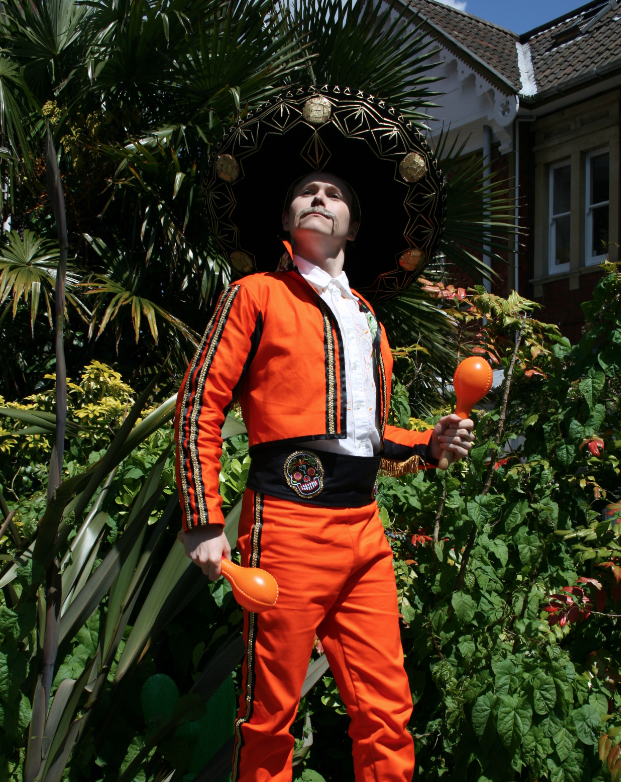 Mucho Brumcha is part of the city’s Birmingham Weekender event; a weekend of world-leading free outdoor performance, art and entertainment. This entry was posted in Art, Birmingham, Dance and tagged Art, Art in Birmingham, Madam Mangos Circus, performance, Voodoo Love Orchestra. Bookmark the permalink.